A significant component of a search engine's ranking algorithm comes from their analysis of the keywords in the text of the page. This includes the density of the keyword in the text as well as the placement of the keyword. That's nice, but what does it mean? Search engines only see the text on your web site; they can't make out graphics or flash movies, more importantly they don't understand navigation buttons that are graphical links. 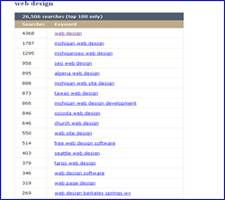 Let's say a visitor is searching for a web site on "Web Design in NJ". They will go to a search engine and type in "Web Design in NJ" or "Web Design in New Jersey". The search engine will go and look for those keywords and phrases on web sites and return the best matches. Seems simple enough! Keyword Research is one of the most important parts in achieving a high rank for those keywords and phrases or becoming one of the first 10 'best matches'. We research your industry and analyze what keywords to target by reviewing several search engines and using numerous keyword tools. We will then determine the most common keyword phrases being used and the amount of competition. In the end we have a compressive list of keywords that customers are using to find your products and services but, have the least amount of competition.